When you prepare cost estimate for obtaining protection for your mark through International Registration under the Madrid Protocol, don't forget to add the second part of the Individual Fee if you are designating Japan. Japan is one of the only two countries which adopted two-payment of the Individual Fee. This article explains when and how these 2 payments have to be made. First part of the Individual Fee is paid at the time of filing an application for International Registration using the official MM2 application form. When you calculate amount of fees for filing the International Application using " Fee Calculator" on WIPO website, the first part of the Individual Fee in respect of Japan will be automatically included in the total amount. You will just have to pay it together with other fees. 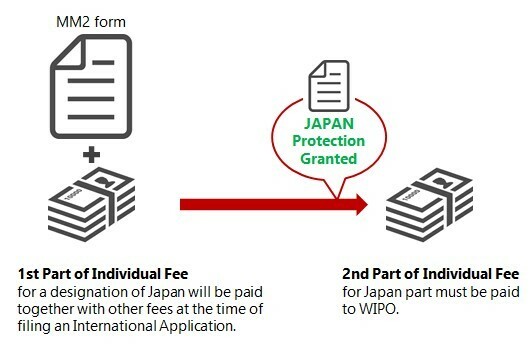 Second part of the Individual Fee has to be paid after protection is granted by the Japan Patent Office (as an Office of a designated Contracting Party). When your trademark application (that is the designation of Japan) is allowed for registration in Japan, the holder will receive following two notifications from the International Bureau of WIPO. Please note that even when a Japanese local representative is appointed to file a response to a Provisional Refusal in Japan, these notifications will be sent directly to the holder (or its representative if any) and not to its Japanese local representative. When you make the payment, please read it carefully and follow its instructions. It is a simple payment to WIPO. No submission of form, letter or any other document is required. When you designate Japan subsequent to the International Registration, when and how you have to pay first part and second part of Individual Fee is the same as described above. As mentioned earlier, if you are designating Japan, don't forget to add the second part of Individual Fee in respect of Japan in your fee estimate. It will become due at a later stage.